The rules are to answer the 10 questions, pass this tag onto 5 bloggers, and to make sure the bloggers you tagged know about this! I would say under 200. I am currently working on a spreadsheet, so hopefully I will be able to give a legit answer soon!! EDIT: Hah.. ugh. 248 + 33 that I took out because I don't ever use them.. plus many, many minis. A lot more than I thought I had. Whelp, time to add more! 2. 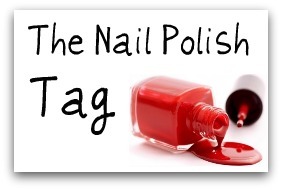 What is your favourite brand of polish? I am going to have to say China Glaze.. But I do hold Orly in high regards as well. 3. Do you like crackle nail polish or do you hate it? I quite enjoy them.. I just don't use them too often. Only when I'm in a rush and need something to toss on to my nails to make them seem fun!! It was probably Maybelline.. Or Cover Girl Crackle polish way back when. I saved some of my babysitting money to purchase it. 5. If you were to have your own nail polish line, what would you call it? I would call it G&G.. It reminds me of the days playing Railroad Tycoon with my dad (aka me teaching him how to play!) and we always named our company G&G (Gloeden & Gloeden, our last name).. I feel it has rad name. I guess that is what my company would be. A line though? Something nerdy and referencing movies or books. I would probably name the colours after my favourite movie murderers.. awkward? Actually, my Deborah Lippmann Glitter in the Air does not suit me at all! It makes my pale skin look too zombie-esque when worn alone. I layered it over What's With the Catitude? and it looks better..
7. What nail polish colours do compliment you? I don't really hate any colours on me.. But that doesn't mean they compliment me.. BUT, I figure I'm a "winter" colour wise, so, any rich tones. I would say my sister for irl nail art friends.. Though I do have friends that are getting more in to painting their nails and such - it seriously makes my heart smile! And online? I'd say Li Lian of shortwidenails - she is such a sweetheart! We have had some good correspondence over the years..
9. What was the best nail polish gift you've ever received? I'd say when I won the Polish or Perish anniversary giveaway. I don't really enter too many giveaways, but I did enter that one and won.. I got so many nail polishes - and brands that I would otherwise never get my mitts on! Alex won one of my Revlon nail polish giveaways.. It finally arrived to her! She is a sweetheart and I was happy to be in contact while we anxiously awaited those gems to get to her! Not only did I get to know her a bit, but I found a new blog to follow - always a bonus! !